So What Exactly Is This Stuff Called Cellulite? And How Did I Get It? What is cellulite? It is that orange peel look that many women are famous for complaining about. But what is cellulite really, and how can we cope with it? In this article, we will shed some light on what cellulite is, and how men (yes, men too!) and women can cope with it. So what is cellulite? The word itself may make an individual think it is a medical condition, but simply put, all cellulite is is fat underneath the skin. It makes the skin appear bumpy and “orange peel-like” because it pushes up against connective tissue and makes the skin above start to pucker. And be aware that cellulite isn’t harmful at all to the person who bears it. But given the way it looks, most folks are ready and willing to get rid of it as best as they can. In order to know how to get rid of cellulite, first we would have to know what causes it. One false assumption about the bearer of cellulite is that you have to be overweight. That isn’t the case. Everyone, even individuals of a normal BMI, can (and probably do) have cellulite at some point in time. However, if you are overweight and suffer from cellulite, it could prove beneficial to you and your condition to get your body in a healthy weight bracket. It’s worth noting that while men do have cellulite, it’s more common in women and especially women who come from a family of prevalent cellulite. Your family history aside, other factors that may point to a problem with cellulite are as follows: poor diet, dehydration, fad dieting, lack of physical exercise and general activity, total body fat present on the individual, hormone changes, and thickness and the color of your skin. Wearing underwear that proves tight across your buttocks can also contribute to a problem with cellulite. Cellulite tends to be less noticeable on darker and thicker skin textures. If you have a pale skin complexion, and plan on going out swimming or doing any sort of activity where you would have your problem areas showing, applying a self tanner can help to make said problem areas less likely to grab attention. 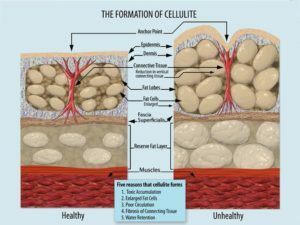 So how would we go about treating cellulite? Many people have tried cellulite creams, but the jury is out on whether or not these creams make any difference. Some of these creams claim to dissolve fat, and help to smooth out the skin. But a number of these creams are harmful to users with circulatory issues, as they narrow blood vessels and force water away from the skin (their apparent take on how to solve the issue with cellulite). An ingredient in the majority of cellulite creams has been found to fuel allergic reactions in some users as well. So whether or not you want to try a cellulite cream for your problem areas is up to you, and should be pursued with caution if you so choose to go this route. Another (and perhaps more pricey choice) cellulite treatment is liposuction. What liposuction does is surgically remove fat deposits from the sufferer’s body. And while it does just that (removes deep body fat), it does not remove cellulite, which is just underneath the skin. But as mentioned above, the removal of body fat and the aim for a more normal BMI can help the appearance of cellulite, as there is less underneath it to push it up toward the skin. Laser treatment, and massage and spa treatments have also been popular among people trying to find relief from cellulite. But many have found that despite these treatments, cellulite is harder to be rid of than otherwise thought. So what about exercise, a healthy diet, and otherwise good healthy habits? You may find that instead of paying for pricey procedures like liposuction (that may or may not help anyway), taking care of yourself and eating right is the way to go. And don’t forget, lots of people suffer from cellulite. Don’t feel like you are alone, because you most definitely are not! So be sure to put on that self tanner, eat right and work out, and don’t wear that underwear too tight!